Says Mitt Romney’s investments created zero jobs. By Becky Bowers on Monday, October 1st, 2012 at 2:15 p.m.
An ad from the union-backed Workers' Voice PAC says Romney's investments created zero jobs. 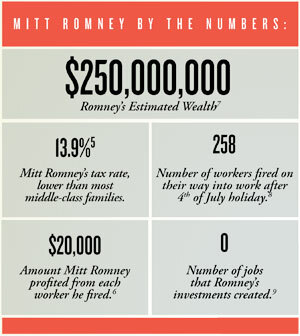 For some voters, the mail recently brought a flier that said Mitt Romney’s investments created zero jobs. For years we’ve checked empty claims from Republicans that President Barack Obama’s economic stimulus created "zero jobs." Zero job creation makes for a catchy attack. But is it any more accurate about "Romney’s investments" than it was about Obama’s stimulus package? Romney made a personal fortune running private equity and venture capital firm Bain Capital, and super PACs are spending millions to show investments that ended with lost jobs and Bain profits. That’s an incomplete snapshot of Bain’s portfolio — in fact, at least several of Bain's companies mushroomed, creating thousands of jobs. Still, the ads and mailers keep coming, like this one the week of Sept. 17, 2012, from a super PAC associated with the union AFL-CIO. The mailer, spotted by POLITICO, calls Romney’s business model at private equity firm Bain Capital "un-American." "0: Number of jobs that Romney’s investments created." A footnote says the source is a May 21, 2012, article published by Businessweek.com. Eddie Vale, communications director for Workers’ Voice, pointed us to the final paragraphs of a BloombergBusinessweek story titled "Mitt Romney's Private Equity Nightmare." The story paraphrases a former Romney colleague at Bain as saying, "the main goal at buyout firms ... is never maximizing employment. ... It’s maximizing returns for investors." Vale said that was the point of the chart. "The goal of Romney’s investments was to maximize profits, not create jobs. We are not saying he never created a job. He needs people to feed his dressage horse and wash his cars," Vale said. "We are saying his investments were about maximizing profit. He did that by laying off workers and sending jobs overseas." But that doesn’t mean Romney’s investments created "0" jobs. In fact, sometimes Bain profits and jobs grew together. Romney has repeatedly claimed that Bain was a job creator. "In the business I had, we invested in over 100 different businesses and net-net, taking out the ones where we lost jobs and those that we added, those businesses have now added over 100,000 jobs." Independent journalists, including us, haven’t been able to confirm that "net-net" Bain investments added 100,000 jobs. Bain won’t release enough information to do the math. But here are some things we do know. Sometimes Bain acted as a private equity firm, buying stakes in businesses, taking out loans to retool the companies and pay themselves fees, then selling their stakes at a profit. Thousands of workers lost their jobs. But some studies show that private equity in general results in minimal net job loss. Companies shed jobs, but mostly make it up with hiring later. Then there are the times that Bain acted as a venture capitalist, investing in young companies to help them grow. (Something that generally requires hiring workers, not laying them off.) That’s the case for companies like Staples, an example Romney loves to cite. And for good reason. • Romney's campaign says three companies in which Bain invested alone have created more than 100,000 jobs: Staples (89,000), Sports Authority (15,000) and Domino's (7,900 jobs added since 1999). That's 111,900 jobs. • Companies that lost jobs include American Pad & Paper (385), Dade International (1,900), DDi Corp. (2,100), Clear Channel Communications (2,500) and KB Toys (3,400). That's 10,285 jobs. Other roundups with a narrower time frame — the years before Romney retired — also show tens of thousands of new jobs, and fewer job losses. None of these tallies is comprehensive. There’s also a fair question whether Romney deserves credit for all jobs gained — or blame for jobs lost. Some commentators say the issue isn’t that Bain companies shed jobs, but that they shed "good jobs." But this ad went way beyond that thoughtful criticism. It said his investments’ job creation was zero. Workers’ Voice says the "number of jobs that Romney’s investments created" is zero. That ignores Bain’s role as a venture capital firm that helped build companies that hired tens of thousands of workers. The PAC, unable to provide data to back up its claim, said the goal of Romney’s investments wasn’t jobs, but profits. That doesn’t prove Bain’s job creation was zero. Nor do examples of Romney investments that lost jobs. This catchy claim comes up empty. We rate it Pants on Fire. Published: Monday, October 1st, 2012 at 2:15 p.m.